Welcome to the opening concert of the Diablo Symphony Orchestra’s 56th season! On the 100th anniversary of Lili Boulanger’s death, this program celebrates the powerful impact that Lili and her sister Nadia had on the musical world, both through Lili’s compositions in her short lifetime, and the inspiration of Nadia’s teaching of virtually every important twentieth-century composer. 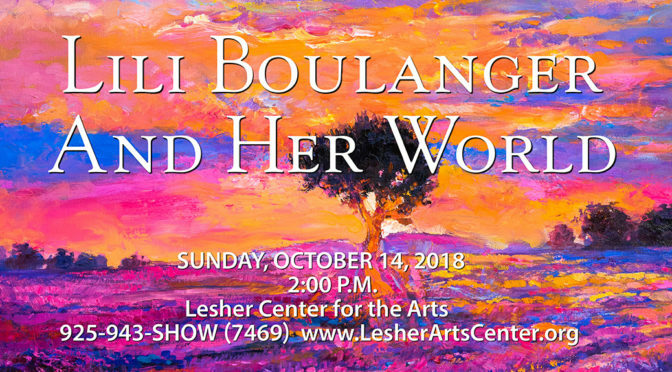 Our concert features compositions by Lili Boulanger, as well as works from composers who inspired, or were inspired by the Boulanger sisters: Gabriel Fauré, Arthur Honegger, Aaron Copland, and Claude Debussy. We are joined by guest clarinet soloist Stephen Zielinski. The two Boulanger sisters were both musical prodigies born into a musical family. Nadia Boulanger (1887-1979), the elder sister, began studying at the Paris Conservatory at the age of 12 with Gabriel Fauré. Despite persistent ill-health throughout her life, Lili Boulanger (1893-1918) followed in her sister’s footsteps and became the first woman to win the prestigious Prix de Rome in 1913. Her two instrumental symphonic poems, D’un matin de printemps and D’un soir triste, display the intense harmonies, accomplished orchestration and the influences of Debussy and Ravel typical of her small body of vocal and instrumental compositions. After Lili’s death, Nadia ceased composing and focused on conducting and teaching composition. She became the first woman to conduct many major orchestras in America and Europe, and her students included many of the leading composers, conductors, and arrangers of the 20th century: Aaron Copland, Quincy Jones, Elliot Carter, Daniel Barenboim, Philip Glass to name just a few. Two pieces on our program feature works by composers who influenced the Boulanger sisters: Gabriel Fauré’s Pavane, and Claude Debussy’s Première Rhapsodie for Clarinet and Orchestra. Stephen Zielinski will be our guest soloist for the technically demanding Rhapsodie. A tenured member of California Symphony, Stephen is a graduate of the Juilliard School’s Master of Music program. Mr. Zielinski has worked with the Twentieth Century Classics Ensemble, performing on two recordings on the Naxos label featuring chamber works of Anton Webern and Igor Stravinsky. He can also be heard on the Albany Records label performing works of Thomas Pasatieri. In the Bay Area, Mr. Zielinski regularly plays with California Symphony, Bay Area Rainbow Symphony, San Francisco Wind Ensemble, Sacramento Chamber Music Society, Nova Vista Symphony and more. We round out our program with works by composers who themselves were inspired by Lili and Nadia Boulanger: Pastorale d’été by Arthur Honegger, and Four Dance Episodes from Rodeo by Aaron Copland.